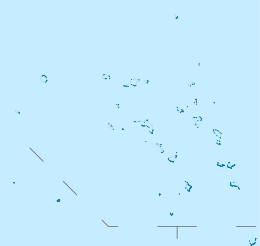 Ailinginae Atoll (Marshallese: Aelōn̄in Ae, [ɑ̯ɑ͡æe̯elʲe͡ɤŋɯ͡inʲ-ɑ̯ɑ͡æɛ̯ɛɛ̯]) is an uninhabited (due to Castle Bravo nuclear testing) coral atoll of 25 islands in the Pacific Ocean, on the northern end of the Ralik Chain of the Marshall Islands. Its total land area is only 2.8 square kilometres (1.1 sq mi), but it encloses a lagoon of 105.96 square kilometres (40.91 sq mi). It is located approximately 13 kilometres (8.1 mi) west of Rongelap Atoll. The landscape is low-lying with only the top 3 metres above sea level. The two entrances into the lagoon are 'Mogiri Pass' and 'Eniibukku Pass'. These are 0.9 and 0.3 miles wide respectively. The average temperature of these islands is about 27 °C (81 °F) during daytime and slightly warmer during night-time due to cold weather associated with rain showers during daytime. The rainy season is from September through November. The island is covered with scrub, grasses and some stands of Casuarina trees. Ailinginae Atoll was claimed by the Empire of Germany along with the rest of the Marshall Islands in 1884. After World War I, the island came under the South Pacific Mandate of the Empire of Japan. Following the end of World War II, it came under the control of the United States as part of the Trust Territory of the Pacific Islands until the independence of the Marshall Islands in 1986. 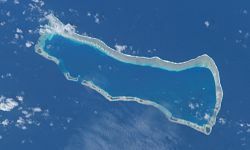 Ailinginae Atoll has been uninhabited since 1954 when the few islanders were evacuated due to nuclear fallout fears from the Castle Bravo test at Bikini Atoll to the northwest. This page was last edited on 13 November 2018, at 03:18 (UTC).